Hello Loves! 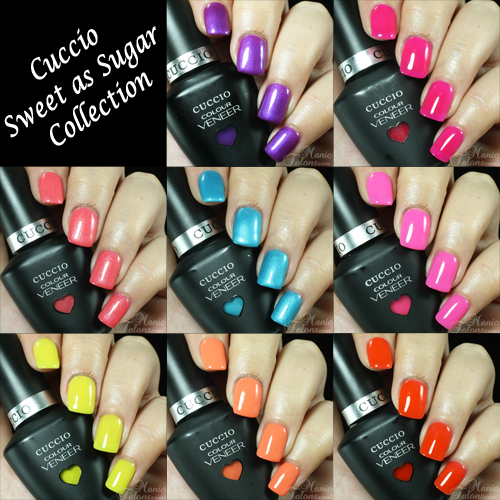 I have the Cuccio Colour Veneer Sweet as Sugar Collection to show you today! 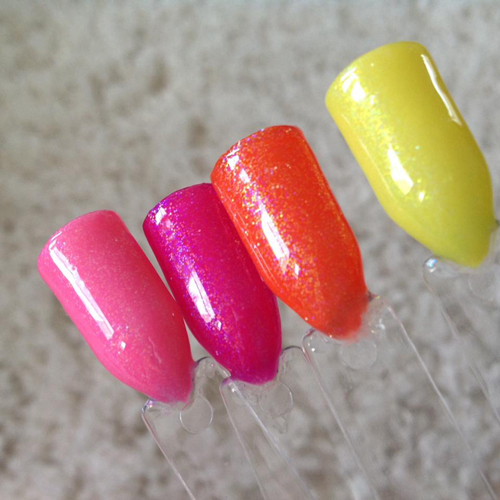 This collection is new to the Cuccio line for Spring 2015 and consists of 8 candy inspired shades. With three shimmers and five squishy jellies/creams, this collection has a bright for every occasion. Ready to see them? Of course you are! First up is Grape to See You. Grape to See You is a slightly red leaning purple base with a blue shimmer that gives the final polish a blue leaning purple tone. I found it to be a little on the sheer side so I needed three coats for opacity. You can see the red leaning purple base around the shadows where the shimmer isn't catching the light. Double Bubble Trouble is a medium toned neon pink. This one is has a milky jelly finish that remains a bit sheer even after three coats. I'm not usually a fan of sheers, but I see great potential with this beauty for layering and sandwiching! Sugar Daddy is a bright, frosty blue with an almost metallic effect that makes it positively glow. You know me and my blues, so of course I adore Sugar Daddy! I did find that it needs 3 coats to completely hide my stubborn VNL, but it builds beautifully. Sweet Treat is a super bright bubblegum pink. This one is similar to Double Bubble Trouble in that it has a milky jelly finish, but it builds to complete opacity in three coats. Definitely a great polish for layering or wearing alone. Look how squishy she is! The depth is incredible. Lemon Drop Me a Line (isn't that name adorable?!?!) is a bright, lemon yellow. This too is a squishy, milky jelly that has endless layering possibilities but builds to opacity in three coats. Finally, Tutti Frutti is a bright, red toned orange. My photos didn't quite capture the vivid quality of this polish, so you'll have to use your imagination a little. Tutti Frutti is also a milky jelly finish for amazing depth and builds to opacity in three coats. I can't wait to play with these a bit more and try some layering and sandwiching. My Cuccio enabler, Angela, shared a photo of some combos she threw together, and they are fabulous! I just had to swatch swipe it to share with you (with her permission, of course). The depth...gah! *The products featured in this post were provided by Cuccio Naturale for my honest review. All links within this post are courtesy links and do not benefit ManicTalons.com. These are gorgeous! Sweet Treat is amazing - great post! Gorgeous collection and I love Sugar daddy!! MMMmmmm! Loving the metallics! I need gum drops for sure!